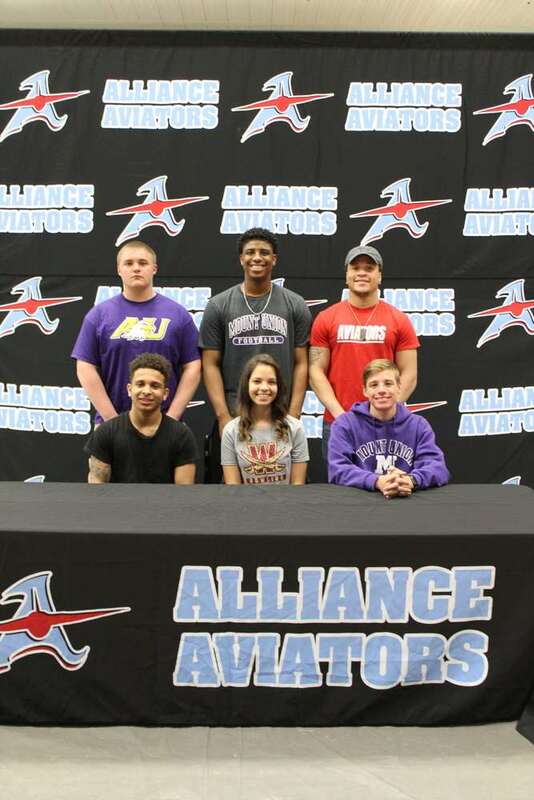 Another group of seniors at Alliance High School signed letters of intent to attend and play a sport for various colleges and universities this fall. Dylan Bailey plans to attend the University of Mount Union and run on the track and cross country teams. He plans to study biology. Anthony Young plans to attend the University of Mount Union to study engineering and play football. Marcus Davis plans to attend Walsh University to study criminal justice and play football. Abby Moore plans to attend Walsh University to study criminal justice and play on the bowling team. Skyler Curry plans to attend Mercyhurst North East to study criminal justice and play on the wrestling team. Alex Leasure plans to attend Ashland University to study education and play on the wrestling team. Alliance City Schools is proud of these student athletes and their achievements throughout their school careers. They will go on to do great things both in athletics and in their academic and professional lives!